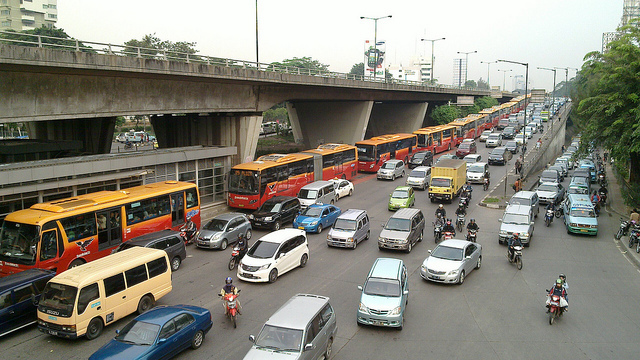 Jakarta's city government is consulting Istanbul's city government for advice on managing traffic congestion for its bus rapid transit system. Photo by nSeika. The U.S. Congress released competing transportation bills, with a $109 billion, two-year bill from the Senate Democrats and a $230 billion, six-year bill from the House Republicans. The latter proposing transport spending cuts of about one-third of the existing funding levels. A new multimedia report, “Mobility 2025: Transforming Quality of Life for Millions of Mexicans,” outlines the benefits of integrated transport and offers a sustainable transport proposal for candidates running in the upcoming elections for the State of Mexico. The report was created in partnership with the Center for Sustainable Transport in Mexico (CTS-México), a member of the EMBARQ network (the producer of this blog), the Institute for Transportation & Development Policy (ITDP) in Mexico and El Poder del Consumidor, a consumer advocacy nonprofit. The European Union invested $6.2 million in researching Personal Aerial Vehicles (PAVs), helicopter-like flying cars. The project is aptly coined “myCopter” and aims to reduce traffic congestion and provide an alternative to inconvenient commercial air travel. Delegations attending the week-long Forum for Sustainable Transport in Latin America signed the Bogota Declaration, a multinational agreement establishing sustainable transport objectives for the region. EMBARQ, the producer of this blog, was one of the event’s supporters. Jakarta’s capital city government began collaborating with Istanbul’s city government to improve the traffic management and control system of the city’s Transjakarta bus rapid transit (BRT) system. A new study found that the planned €100 million (US$143 million) of bicycle infrastructure investments in the Netherlands will yield annual profits of at least €144 million (US$205 million) due to gains in travel time, along with environmental and health benefits. The Institute for Urban Design’s (IfUD) “By the City, For the City” competition to revitalize New York City’s public spaces received nearly 550 idea submissions and is now accepting design proposals. Submissions must be received by July 14. Los Angeles Mayor Antonio Villaraigosa ordered city department heads to “build a 1,680-mile bikeway system and make the city more bike-friendly.” The order equates to 40 miles of bikeway construction each year, a fourfold increase in the city’s previous construction rate. In the competition for this year’s top-selling electric car, the Nissan LEAF is currently in the lead with 3,875 vehicles sold, compared to the Chevy Volt’s 2,745. LSP, a synthetic biology company, and MAN Latin America, a Brazilian engineering and vehicles manufacturing company, collaboratively began testing renewable diesel fuel for both stationary engines and fleet vehicles in Brazil. The U.S. Environmental Protection Agency finalized the Cross-State Pollution Rule, which sets reductions on the emissions of sulfur dioxide (SO2) and nitrogen oxides (NOx). The rule is purported to improve air quality for 240 million Americans. Global investment in renewable energy increased by roughly 30 percent in 2010 to US$211 billion from US$160 billion in 2009. Last year’s figure is a whopping 540 percent increase from 2004 investment levels. Shenzen, China outlawed electric bikes due to safety concerns originating from the bikes’ quiet operations. City officials state that the easily unnoticed bikes have caused more than 15 percent of city accidents, resulting in 64 traffic crash fatalities. A new study of 11 years of traffic safety records found that cities with high levels of biking average roughly four times fewer bike crash fatalities than cities with low levels of biking. Pedestrian and cycling crashes occur disproportionately more in Los Angeles’ areas of lower-income residents, according to new analysis of the SafeTrec at UC Berkeley TIMS database. Cycling in a heavy traffic may have a significant negative impact on cardiac functioning, found a new Canadian study in Environmental Health Perspectives. The study’s researchers recommend cycling infrastructure on low-traffic roads or cycling lanes separated from car traffic. To promote awareness of the 3-feet bicycle-passing law entering into effect in states across the U.S., 3feetplease.com is selling biking jerseys and t-shirts with audaciously readable phrases like “3 Feet Please” across the back. The state of Utah is promoting cooperative road use through their “Respect the Road” campaign, which features billboards encouraging cyclists to ride in single-file. The Washington Metropolitan Area Transit Authority (WMATA) launched its 6-year, $5 billion Metro improvement program, Move Forward, with a new website and social media to promote public education and awareness. Tags: air quality, Asia, Bogota, Brazil, China, Colombia, crash fatalities, cycling, diesel fuel, electric vehicles, Europe, european union, Houston, Integrated Transport, Los Angeles, Mexico, Netherlands, Nisson LEAF, North America, personal vehicles, public space, red-light cameras, renewable energy, road safety, Santa Fe, Shazen, South America, transportation legislature, U.S. Congress, U.S. Environmental Protection Agency, United States, Volt, Washington, D.C.